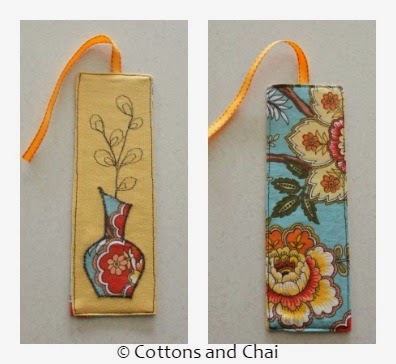 Cottons & Chai: Handmade Holiday Gift #1: Fabric Bookmark! 'Tis the holiday season and I'm sure a lot of us have 'gifts' on our minds! So we thought, what better ideas to blog about than a set of nifty, relatively easy and quick handmade gifts/ crafts that will surely dazzle and impress the recipient! Welcome to our first in the series: this one is for all the bookworms out there and I know there are plenty. My toddler son too loves books and has been devouring them ever since he was just a few months old.. that is, until I informed him books are not food and therefore should not be eaten. 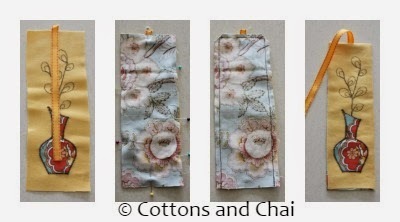 So anyway, today I want to show you how I made this delightful two-sided fabric bookmark - finished size 7.5" * 2.5". 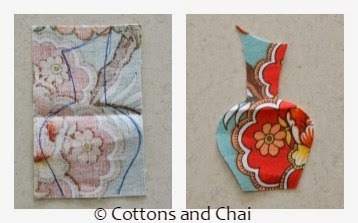 1) One piece of printed cotton fabric 8" * 3"
2) One piece of solid cotton fabric 8" * 3"
3) One piece of printed cotton fabric 3" * 2"
4) One piece of cereal box card 7.5" * 2.5"
I started off by drawing a vase shape on the back of the little printed fabric piece and cutting the shape out. Next I appliqued the vase at the bottom of the solid fabric piece, after positioning it such that there is a gap on all sides for seam allowance. 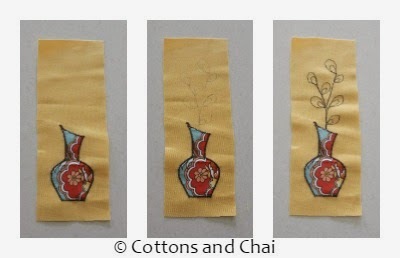 Then with fabric marker I drew a floral design and proceeded to 'embroider' it using a dark colored thread (in this case, chocolate brown). I did this by using a simple straight stitch and just going over the drawing I made. Time to assemble the bookmark! 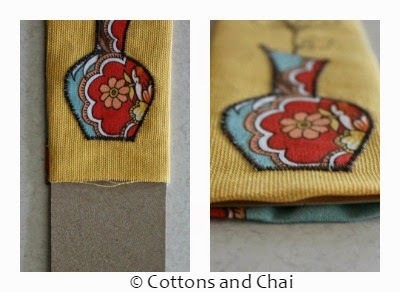 1) I placed the appliqued piece on work surface with right side up and positioned the ribbon top center with a little bit jutting out at the top so that it gets caught in the seam. 2) Then I placed the printed piece over it and pinned all around. 3) Next I sewed all around 3 sides with a precise 1/4" allowance, left the bottom edge open and clipped corner. 4) Finally I turned it inside out and gave it a good press. Then I slipped in the cereal box strip to stiffen the bookmark and pressed the bottom edges in 1/4". Tip: Trim the cereal box strip if required. Also, if this feels cumbersome, try folding the edges in first and then slipping the cereal box strip inside. Finally I went back to the machine for a last top-stitch all around. 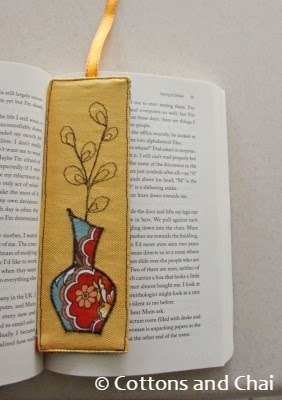 My delightful little reversible bookmark is done! So I hope you enjoyed our novel bookmark idea and if you did, you might want to - ahem - bookmark this page and come back again to give it a try! Stay tuned for more handmade gift ideas. This is too adorable! I have to try making a few of these. Not sure if I can manage the freehand machine "drawing". I agree! It is really adorable! The slight slant top of the vase looks very stylish. These would make perfect gifts for friends at book club. 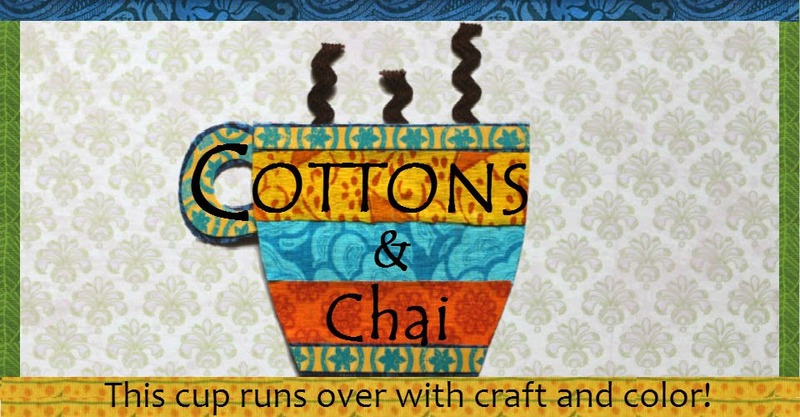 Kashmira, this is such a creative blog! Kudos to you both. 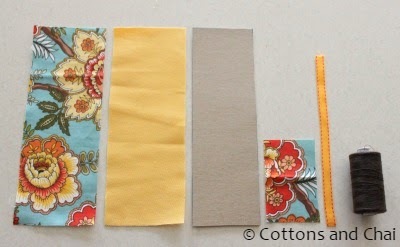 Loving the tutorials and wishing I had a sewing machine.